This spring we made a major shift in our approach to gardening, and replaced our front lawn with beds for the garden. Our front yard now has a collection of 5′ x 10′ beds with various vegetables coming up. After laying out the wood border for the bed, I spread out a layer of cardboard as a barrier to smother the grass of the old lawn. On top of the cardboard went a 3 inch deep layer of mostly composted horse manure from a person about a mile down the road from us. The manure was about 6 months old, and was a deep brown color with some red composting worms living in it. Dave warned me about putting his unfinished compost in the garden–that it may not let anything grow at first–but I decided to take that risk and I used in anyway. 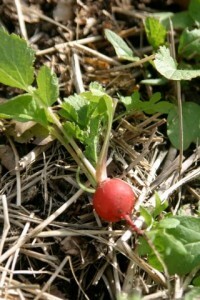 The grass from the lawn has not come through the new beds, and you should see the radishes! Until this year, I’ve always had problems with getting a decent radish to grow for me, but this spring they are beautiful. Samuel and I went out last week to thin them and we came back with a handful of dime-sized bulbs that were sweet and juicy. They barely have the first couple of leaves out and are already nice and round. This is going to be a great garden year! The King Conservation District has a list of farms with free manure available. Most of these are horse owners who are glad to have someone come and haul it away for them. I took 4 pickup loads from the horse owner down the road, and Dave even loaded my pickup with his tractor. I’ll be visiting him more as time allows this spring! This entry was posted in Farming, Gardening and tagged compost, Gardening, manure. Bookmark the permalink.